Providing physiotherapy to patients of all ages, from infants to the elderly. We offer both Traditional Chinese Acupuncture and Western Acupuncture. We specialise in treating pain in your buttock/posterior leg originating in the back. Our team at experts at helping those suffering from incontinence, whether brought on by stress or an underlying condition. At Jill Kerr Physiotherapy Edinburgh we ensure detailed assessments of all our patients is at the core of our treatment plan to safeguard bespoke treatment for all patients. Jill Kerr Physiotherapy Edinburgh are dedicated to continuing to develop academically and clinically to ensure clients receive the most appropriate and up to date treatments suitable for them. Communication is important to Jill Kerr Physiotherapy and we strive for contented and satisfied client experiences. Clients can expect to be treated courteously and confidentially at all times. With over 24 years experience in hands on Musculoskeletal Physiotherapy Jill Kerr Physiotherapy have treated everyone from the general public to elite athletes both privately and within the NHS. "A Practical Approach to Musculoskeletal Medicine 2016"
In 2006 Jill was awarded an Msc in Orthopaedic Medicine by Middlesex University and is currently a Module Leader and Professional Advisor for students enrolled in that very same Masters programme. 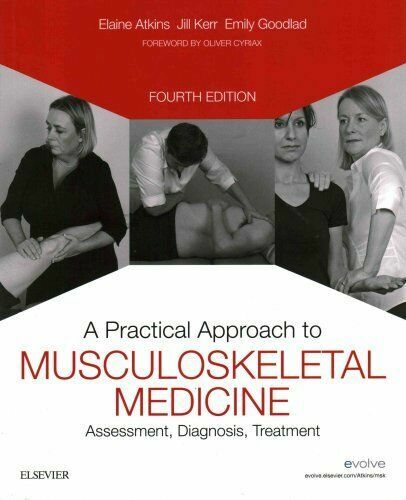 Jill is a co author in the textbook "A Practical Approach to Musculoskeletal Medicine, "4th Edition 2016. Adding to this, Jill is also a co author in another textbook "A Practical Approach to Orthopaedic Medicine," 3rd Edition 2010 published by Atkins, Kerr and Goodlad. 20% OFF Initial Appointments for MSK for NHS staff. Jill Kerr Physiotherapy Edinburgh specialises in all musculoskeletal conditions such as Sports Injuries, all types of arthritis, back and neck pain, ligament sprains, bursitis, tendon injuries or tendinopathy, joint pain, post joint dislocation or post fractures and post joint replacement and chronic pain. Jill Kerr Physiotherapy is based in Therap-ease Treatment Centre on Morningside Road, Edinburgh. Appointments are available Monday to Friday 8am to 8pm with reception cover on Saturday and Sunday mornings too. Home visits are available on request. "Jill Kerr is amazing - I am a really busy University Professor and Veterinary Surgeons who runs Clinics and travels all over the world giving talks. Unfortunately I also have a very bad back following an old car injury. Without Jill's constant care I would not be able to do what I do and would have had to retire years ago. Thank you Jill." Danielle Gunn-Moore, Professor of Feline Medicine, University of Edinburgh & Patient. "Jill Kerr has enormous experience in treating musculoskeletal injuries but also has a reputation as an outstanding post-graduate tutor and author in her field. She teaches all around the world and if you are lucky enough to be her patient, you can be sure you are in very expert hands"
"Not only is Jill Kerr a first class physiotherapist specialising in the management of musculoskeletal disorders, she is also one of the finest teachers of musculoskeletal medicine in the UK. Anyone meeting Jill, either as a patient or being taught by her, will realise very quickly that she is someone at the top of her profession." "Congratulations to Jake Kerr on winning his first cap, playing in the Six Nations Rugby for Scotland. And many thanks to Jill for the great physio: knees, backs and shoulders, Jill will keep you moving." Interested in our services? Let's get you started. Jill Kerr Physiotherapy is registered with the following practises.